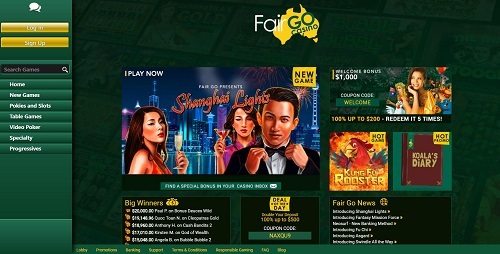 Fair Go Casino is a relatively new online casino, hoping to tap into Australia’s already over-saturated online casino market. Established in 2017, Fair Go is tailored to the Australian betting market. With so many already established online casinos for Aussie players to choose from, does Fair Go get our seal of approval? We sent our experts to review this new online casino and see how it stacks up. Any new casino to the online scene is going to need to offer players a great welcome or sign up bonus. Fair Go offers a fairly straightforward welcome package that is simple and easy to understand. The first five deposits a player makes up to AU$200 will be matched by the casino by 100%. This equates to a potential welcome bonus of up to AU$1000. While not the biggest bonus we’ve seen online, this one is relatively easy to obtain. Some of the bigger bonuses we’ve seen require a huge start-up deposit from players to fully maximise. Fair Go also provides great promotions to its existing players as loyalty rewards. Players can enjoy monthly rewards, such as the February bonus which is a free AU$20.00. There are also great daily rewards such as Koala Monday, Fair Friday, as well as bonuses offered to mobile players. These promotions include cash bonuses based on deposits, in the case of Koala Monday, or 30 free spins as in the case of Fair Friday. In fact, almost every day of the week, including Saturday and Sunday, has a great little bonus to help kickstart any gambling session. Fair Go also offers a VIP or loyalty program for returning regular players. All in All, Fair Go offers one of the most comprehensive bonus and promotions program we have seen. We encourage players to closely read the terms and conditions of all bonuses and promotions so that they understand the requirements for each and are not surprised by any issues. Don’t forget to take a look at the progressive jackpot slots offered by Realtime Gaming for truly life-changing sums of real money. Video poker is also very popular and well supported at Fair Go, and can be enjoyed in many different formats. All games offer full mobile device support and can be played on your smart devices. Withdrawals can take up to 2-3 days to process, with e-wallets offering the quickest payout times. The withdrawal limit is capped at AU$2,500 per week per customer, which is a bit on the low side. However, the quick payout times make up for this. Players are encouraged to read the terms and conditions regarding each banking method to see if there are any transaction fees or any other considerations. Aussie players can rest assured that all transactions occur in AU$. Fair Go offers players 128-bit SSL encryption software, which is used to keep players personal information and data safe and secure. You know when signing up with Fair Go that your data is completely safe. Fair Go is also fully licensed, accredited and audited by third parties, meaning all games are fair and above board. If you run into any issues of any kind, you can easily contact the casino’s customer care. Fair Go offers an international call centre as well as live chat support and email support. When tested, we found the customer support centre to be both efficient and friendly. We don’t often recommend brand new casinos, as it takes a few years to get everything right. We couldn’t find anything to fault with Fair Go, however, and that’s why we fully recommend it to our Aussie players. Fair Go offers great casino game variety and a safe gaming environment, all wrapped up in a slick online package. We give Fair Go four out of five stars!